After exhausting brothers, cousins, and bandmates, I’m so glad to see this series return to Kane and Miki. The original pair is back as a committed couple with a whole lot of history behind them. These two have accepted each other’s quirks and adapted to the idiosyncrasies of their shared lives. Old fears and memories surface when Miki is abruptly confronted with his past. I love that Kane and Miki face the threats to Miki’s safety together without the angst and doubt that would have had Miki fighting Kane at every turn a couple of years ago. I also love the way Miki now accepts his place in Kane’s family. Kane’s investigation into Chinatown’s murky underworld is complicated and scary at times. With Kane and Miki already a settled couple, there is more focus on the police and their investigation than the romance in this book and I really enjoyed the murder mystery element of the story. This feels like the end of what has become a favourite series and though I’m sad to see these characters go, this is a satisfying end and it does justice to the series. 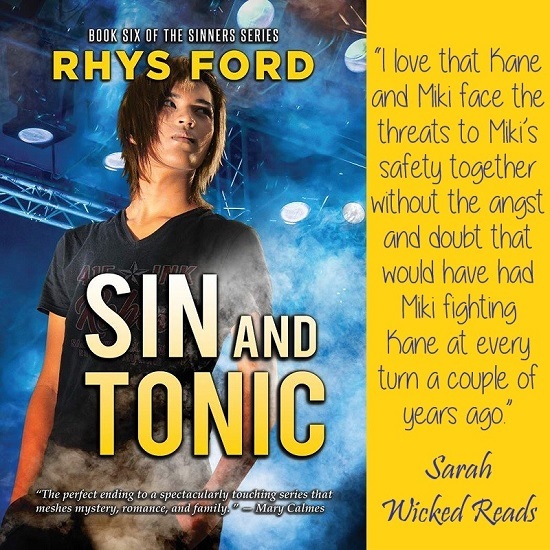 RHYS FORD is an award-winning author with several long-running LGBT+ mystery, thriller, paranormal, and urban fantasy series and was a 2016 LAMBDA finalist with her novel Murder and Mayhem and a 2017 Gold and Silver Medal winner in the Florida Authors and Publishers President’s Book Awards for her novels Ink and Shadows and Hanging the Stars. She is published by Dreamspinner Press and DSP Publications. She’s also quite skeptical about bios without a dash of something personal. Rhys shares the house with two cats, Yoshi, a grumpy tuxedo and Tam, a diabetic black shorthair, as well as a ginger cairn terrorist named Gus. She is also responsible for the care and feeding of a 1979 Pontiac Firebird and enjoys murdering make-believe people. 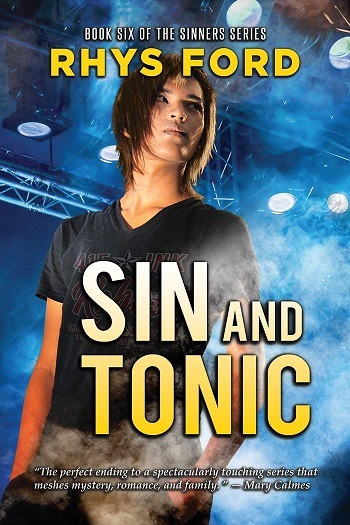 Reviewers on the Wicked Reads Review Team were provided a free copy of Sin and Tonic (Sinners #6) by Rhys Ford to read and review.